Got yourself a new and shiny BlackBerry Motion? 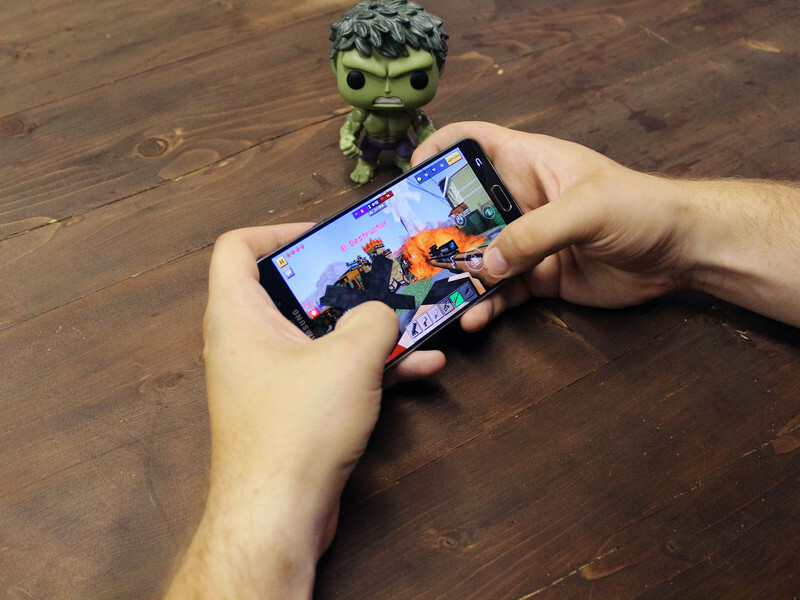 The Android smartphone made a debut in the US market last month and is capable mid-ranger coming with a large battery and a full 5.5-inch display (no QWERTY keyboard included). 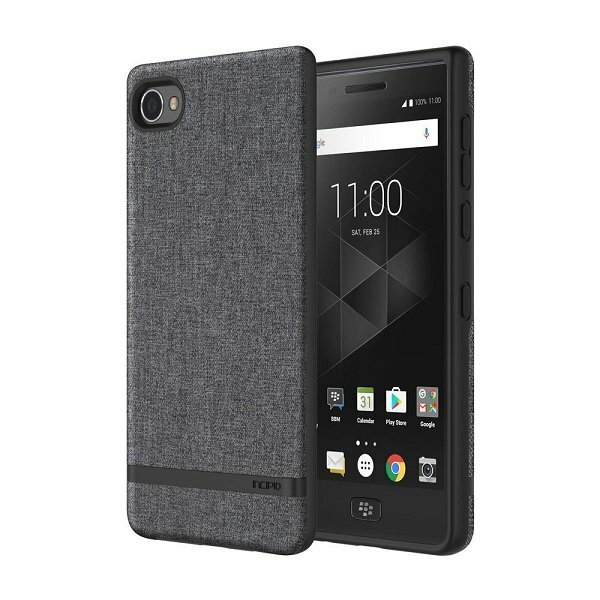 The Privacy Flip Case for the BlackBerry Motion wraps around your smartphone to keep it safe. It boasts a full-touch privacy filtered front cover, which limits viewing angles for onlookers, hence the name. You can grab it from MobileFun for $46.99. Looking for some durable protection? The official Motion Hard Shell cover is just what you need. It has 2H hardness against scratches and bumps and it’s partially see through, so the beautiful lines of the smartphone are still visible. MobileFun sells it for $34.99. 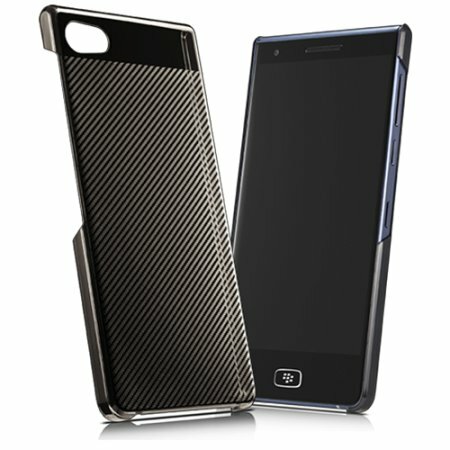 An elegant case made of ultra-soft fabric finish which can protect your BlackBerry Motion against accidents while keeping it stylish. 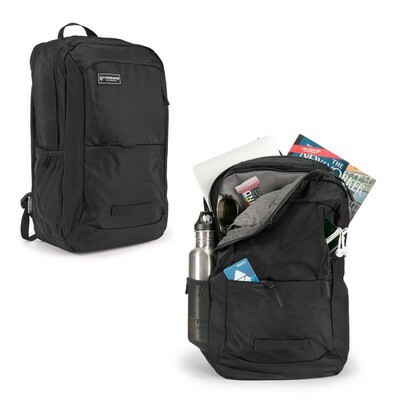 Its impact-resistant TPU frame disperses shock caused from accidental bumps and drops. It’s available in Gray from Amazon for $34.99. The case also gets bonus points for the subtle Incipio logo placement on the back. Add a dash of color to your BlackBerry Motion with one of the colorful cases by Kwmobile. 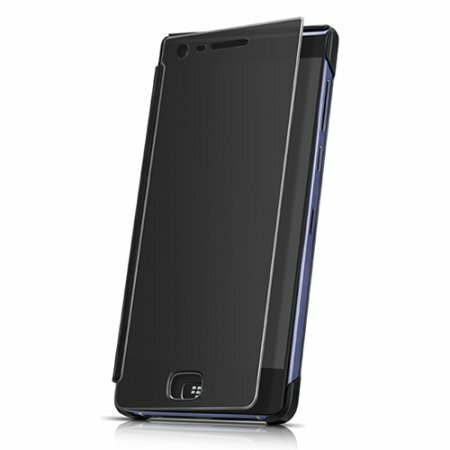 Made of flexible TPU material, the case protects against accidental slips and drops, as well as smudging. 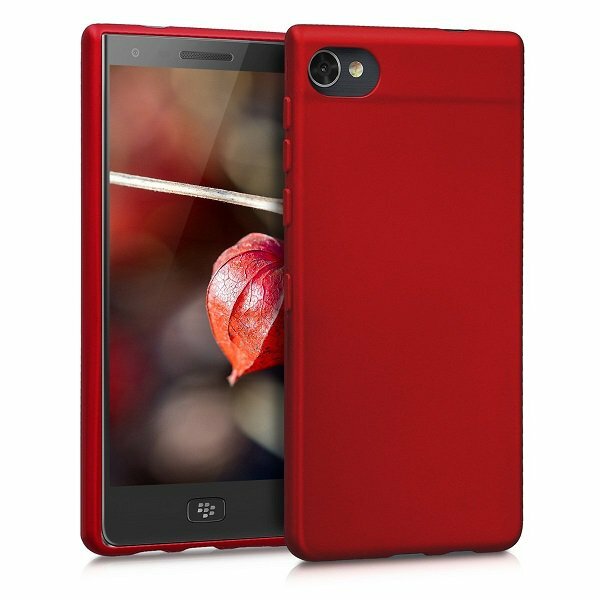 The Kwmobile Case is available in a number of intense colors including Red, Dark Red, and Metallic Blue. Order one for only $7.90. 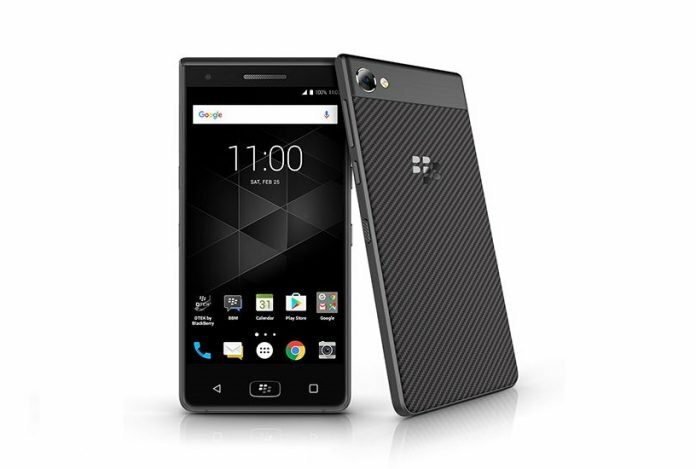 The BlackBerry Motion is powered by a Snapdragon 625 processor, aided by 4GB of RAM and 32GB of built-in storage. Need more? No problem, there’s a microSD card slot on board, so you can easily expand via a microSD card. 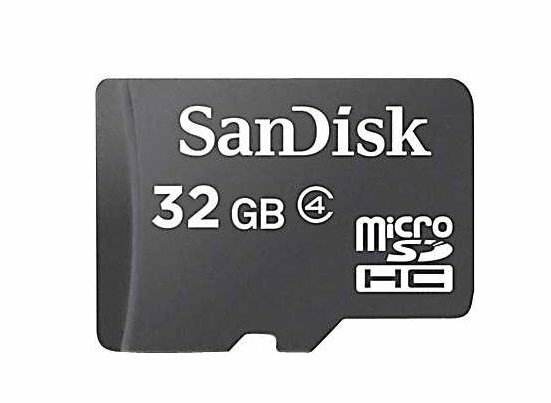 For example, you can purchase the SanDisk 32GB micro SDHC card with a big discount at Mobile Nation. Pay only $19.95 for it, instead of $79.99. The BlackBerry Motion takes even bigger microSD cards, so you can get a 64GB one or a 128GB card. Got slippery hands? 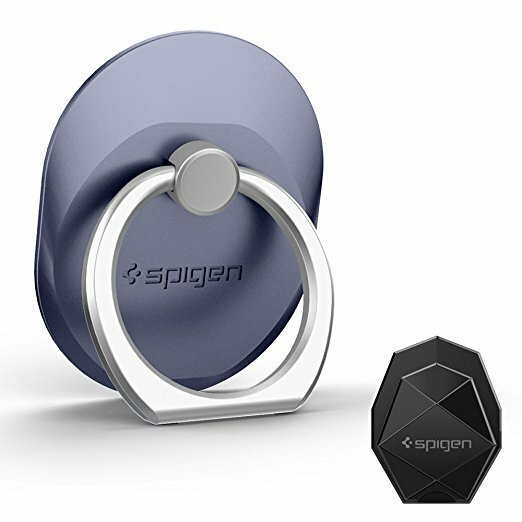 Then the Spigen mobile phone holder might be something you want to get for your BlackBerry Motion. The ring attaches itself to the back of the phone and ensures you never drop your phone again. Users simply need to slip their finger through the ring. The Spigen mobile phone holder is a great solution for concertgoers who like to take pictures throughout the performance. It also doubles as a kickstand for watching video. The accessory is available on Amazon for $13.99 in a variety of colors including Red, Champagne Gold, Orchid Gray and Rose Gold. 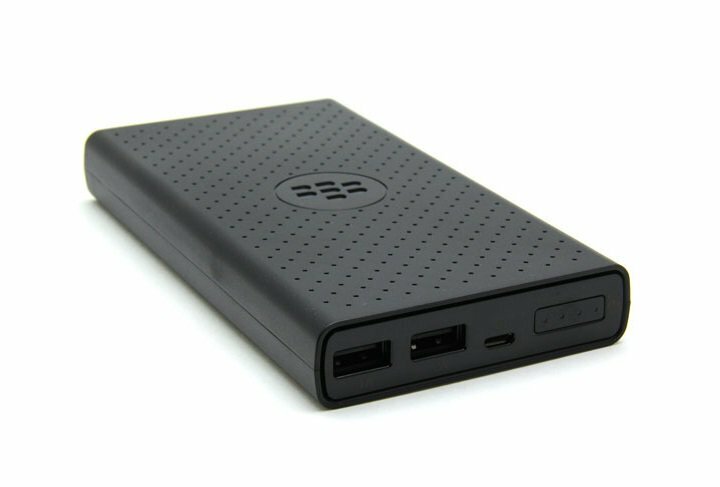 Ensure your BlackBerry Motion never runs out of battery with the BlackBerry High Capacity Mobile Power Charger. The battery pack has a capacity of 12,600 mAh and it can easily juice up your smartphone on the go. With 3A total output, users can charge multiple devices at a time. A LED battery power indicator shows how much power is left and when the battery pack needs charging. The accessory is available for $47.95. Need to charge your BlackBerry Motion super quick? 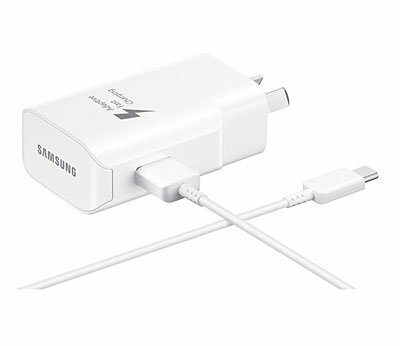 Then you might want to consider this Samsung Wall Charger. With this charger, battery levels on your BlackBerry Motion can jump up from zero to 50% in just 30 minutes. It has a standard output of 2 amp and comes with a detachable USB to USB-C cable, so users will be able to charge their device from the USB port on their computer or other USB-powered ports. It costs $29.95. The BlackBerry Motion supports Quick Charge 3.0, so you’ll need accessories to match. Like the iRAG Car Charger which allows you pump juice in your phone quickly and efficiently while you’re driving. 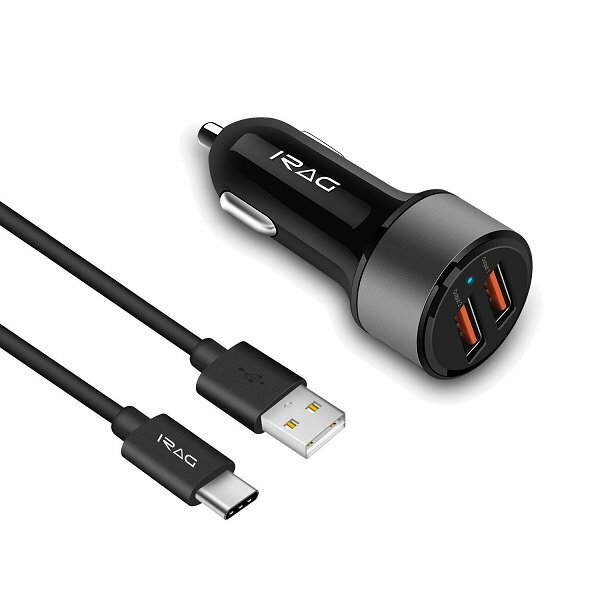 The package includes the 36W Two-Port USB Car Charger and a 6ft long USB Type C to A Charging Cable. You can order one for $13.99 a pop. So, did any of these accessories catch your attention? Tells us which you think are the most useful in the comment section below. Surely no space adventure — of the fictional type, at least — is complete without assistance from an A.I. character. Think HAL in 2001: A Space Odyssey, Moon‘s GERTY, and Holly in the BBC’s Red Dwarf. Developed by Airbus and Germany’s DLR space agency, and powered by IBM’s Watson supercomputer, CIMON — short for Crew Interactive MObile companioN — will be the first form of artificial intelligence to arrive on the space station and will do its best to help the astronauts with a range tasks, as well as be their buddy. CIMON will travel to the ISS with German astronaut Alexander Gerst in June, 2018, as part of the European Space Agency’s Horizons mission, and stay there until October. “We are the first company in Europe to carry a free flyer, a kind of flying brain, to the ISS and to develop artificial intelligence for the crew on board the space station,” said Manfred Jaumann, Airbus’s head of microgravity payloads. In simple terms, CIMON resembles a floating computer monitor with a crudely drawn face on the display. But according to CIMON’s creators, it’s a whole lot more than that, with the team behind the 11-pound (5 kg) contraption claiming it will help solve problems while behaving like a regular crew mate. Thanks to its A.I. smarts, the more CIMON interacts with the crew, the more it will learn about their work. It will also recognize each crew member and respond accordingly, gradually improving as an assistant to become “a genuine colleague,” as Airbus puts it. Once CIMON has settled into life on the space station, Gerst will work with his A.I. assistant on three specific tasks, the most interesting of which involves performing a complex medical experiment using CIMON as an intelligent flying camera. But Airbus’s creation won’t be the first high-tech bot to visit the ISS. Over the years, the station has also hosted Japan’s Kirobo, a floating camera sphere called Int-Ball, and a humanoid robot called Robonaut. Social (Net)Work: What can A.I. catch — and where does it fail miserably? Amazon CEO Jeff Bezos really started something when he unveiled a prototype of one of the first-ever delivery drones back in 2013. Engineers are still working on the Prime Air machine, but since then a growing number of companies around the world have been developing and testing their own drone-based delivery platforms to offer a whole new way of getting goods from A to B. Educators are also participating in this exciting technology, with Stanford University recently launching a course in Aerial Robot Design, part of which involves dreaming up concepts for delivery drones and putting them into action. This year’s students are already building autonomous quadcopters from scratch, fitting them with custom delivery mechanisms, and testing them out in the field. The current class of budding engineers has already discovered that for drone delivery over longer distances, quadcopters aren’t ideal. Students have been tasked with creating what some consider as the ideal delivery drone — a machine that lifts off the ground vertically before switching to winged flight for the main journey and then coming back down vertically to drop off the delivery. The ongoing work has so far involved plenty of experimentation with all aspects of drone design to build a machine with optimal flight efficiency, while teams have also been trying out various delivery methods, including trapdoor mechanisms, parachutes, and spring-loaded boxes. The skills that the students are developing are wide ranging to ensure that they will have plenty of employment options beyond pure drone design. But those that do take their current interest into the workplace could certainly have a hand in the creation of tomorrow’s drone delivery systems. Sharkskin helped Phelps swim faster — can it make drones fly better? At long last, the moon may acquire its very own 4G network thanks to a partnerships between a few tech giants and a team of “part-time” scientists. The proposed plan will see Vodafone, Nokia, and Audi join forces with a German group called PTScientists (previously known as Part-Time Scientists), who want to achieve the first privately funded moon landing via a SpaceX Falcon 9 rocket next year. 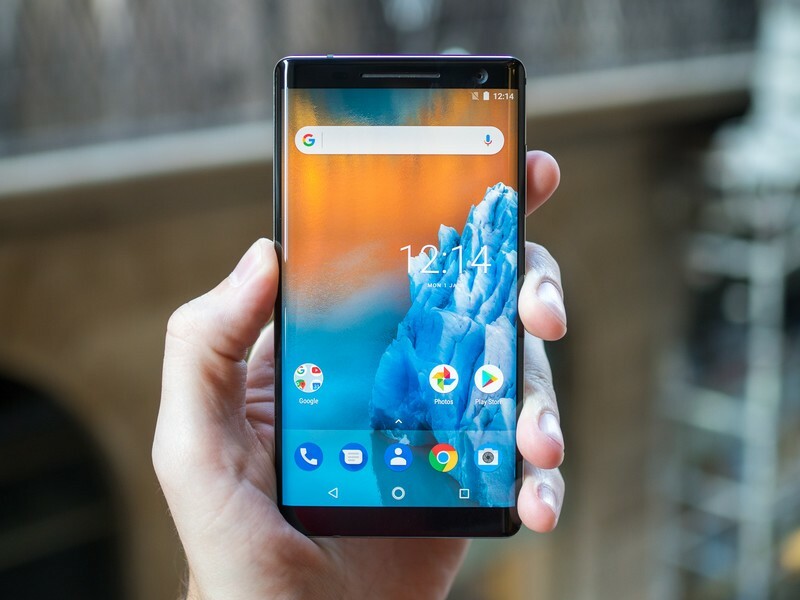 The 4G will be enabled by a Nokia-powered technology called the Ultra Compact Network, which the company says weighs less than a bag of sugar. In the Mission to the Moon, Bohme and his partners hope to land two Audi lunar Quattro rovers equipped with 4G, so they can talk to each other. Cruising the lunar regolith, the rovers will track down the Apollo 17 rover and live-stream the abandoned vehicle in HD. “This project involves a radically innovative approach to the development of mobile network infrastructure. It is also a great example of an independent, multi-skilled team achieving an objective of immense significance through their courage, pioneering spirit, and inventiveness,” Hannes Ametsreiter, CEO of Vodafone Germany, said. That is, if the mission comes to fruition. As with all outer-space endeavors, timelines tend to be flexible. Either way, the companies hope their efforts will help shape technology on Earth as well as space, paving the way for the technological infrastructure of our nearest space satellite. “This important mission is supporting, among other things, the development of new space-grade technologies for future data networking, processing and storage, and will help advance the communications infrastructure required for academics, industry, and educational institutions in conducting lunar research,” Marcus Weldo, Nokia CTO, said. Colin McRae Rally is still one of the purest racing games for Android. 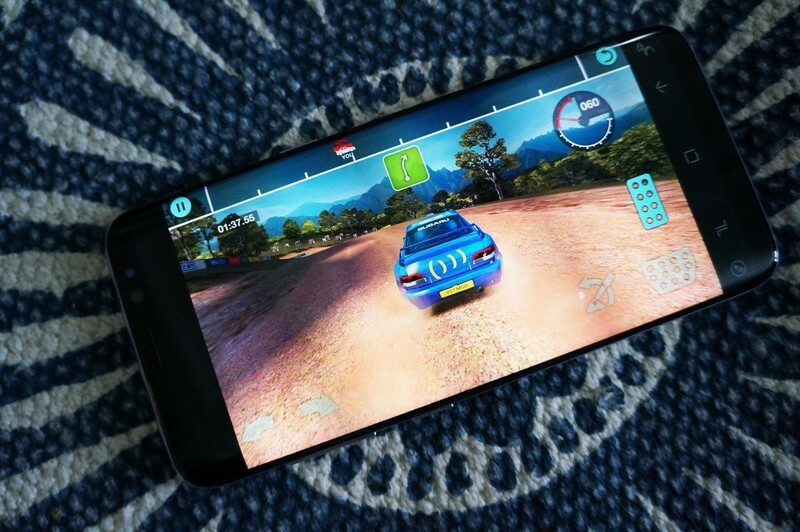 It’s hard to find pure racing games on Android — games that don’t bog you down with in-app currencies to monitor, put limits on the number of races or lock you into switching lanes. Is it too much to ask for a game that just delivers honest-to-goodness racing? Surprisingly, the answer for me is a game series that’s been around for 20 years — Colin McRae Rally. I remember first playing the first game in the series on PC or PlayStation and it was one of the top-notch games of its time. Unlike traditional racing games that focus on street racing or traditional racing circuits, Colin McRae Rally was one of the first games that I ever played that focused solely on rally racing on dirt tracks. Colin McRae Rally would be revitalized on mobile in 2013, with the developers at Codemasters launching an updated version of the game first on iOS and a year later on Android. It’s a game that obviously strikes a nostalgic chord for myself, but also delivers a much more pure racing experience than other racing games for Android. This game is no-frills racing. The menus are subdued and basic, and you can get straight to racing within a minute of launching the game. There’s a quick race option that just throws you right into a random stage with a random car, or you can dive into championship mode where you play through the games’ eight rally series (which includes the first introductory rally). Each rally is broken up into six stages. Each stage takes about four minutes or so to complete and it’s a pure race against the clock — there are no other cars on the track. Just like true rally racing you get track information about the upcoming turns and jumps from your co-pilot, which gives the game a good sense of realism. You’ve got to drive smart as your car acquires damage if you drive it like a maniac, and you only get a chance to repair things after two stages. The early rallies are pretty easy to cruise through like a wrecking ball. You can crash into trees and take huge jumps that toss your car like a matchbox toy and still end up finishing in first place, but that’s intentional so that the game can ease you into the racing style before upping the difficulty level. The biggest draw for me is the racing physics. Rally car racing is all about ripping down dirt tracks and drifting through tight corners at high speeds, and Colin McRae offers a great sense of speed and control — in spite of the touch controls which are less than ideal. You also have the option of tilt controls, but I’ve found that tapping the steering buttons offers much better control than tilt ever could. Are the physics perfect? No. If you slide off the track a bit and graze a young tree, your car reacts like it just slammed up against a steel girder. At first, it’s kind of jarring, but once you accept that every tree is going to act the same and stop you in your tracks it just makes you more careful to not fly off course. As you progress through the championship mode, you damn well better learn to stay on course or else your opponents will leave you in their dust. Ultimately, I think I’ve had the most fun playing Colin McRae Rally Racing over any other racing game I’ve played on Android. Part of that is due to my previous experience with the series, but it’s also because this is a pretty good port of a really good racing game. Sure, it would be nice if there were more cars and more tracks but if any of that was also linked to loot boxes or in-app purchases I’d be much less inclined to recommend it. Colin McRae Rally seems to have been removed from the Google Play Store, or simply may no longer be available in Canada for Android, but fortunately, it’s available as part of the GameStash library. Starting first with UFC 222. If you’re a fan of watching some of the world’s best fighters duke it out in the octagon, tuning into your favorite UFC fights is about to get a lot easier. Beginning with UFC 222 on March 3, you’ll be able to purchase and stream pay-per-view matches directly through Amazon Prime Video. You can access these fights through the Prime Video app on all your devices (including Android, Roku, desktop, etc. ), and if you’ve got a Fire TV, you’ll be able to buy and watch them through the main user interface. You’ve previously been able to watch fights through the UFC app, and while doing so through Prime Video doesn’t offer any extra benefits, it’s a nice touch for folks that like living in Amazon’s ecosystem as much as possible. You can pre-order events and purchase them up to four hours after they’ve begun, and you’ll have 24 hours after its starting time to go back and rewatch what went down. UFC 222 is currently up for pre-order for $64.99 in HD, and you don’t have to be a Prime subscriber in order to buy it. Daniel Bader, Andrew Martonik, Alex Dobie, Michael Fisher, and Derek Kessler, spend their final evening in Barcelona sequestered in an apartment with drinks aplenty as they recount all the announcements from MWC 2018. 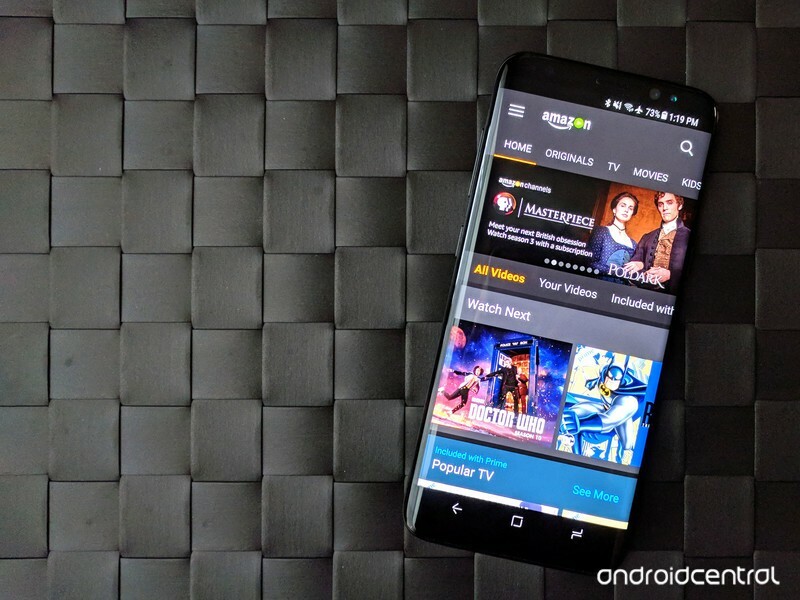 It’s truly an Android news bender of epic proportions. Seriously, this episode is worth every moment of your time! We’ve been dreaming of universal translators throughout the history of science fiction; Star Trek has only popularized the concept. As computing power and AI improves in real life, we’re seeing the possibility of an actual real-time translation system become more of a reality. Products like Samsung’s Bixby and Google’s Pixel Buds and Assistant are early examples of the technology. Now, according to a report at Yahoo Finance, Amazon is looking to turn its ubiquitous Alexa digital assistant into a real-time universal language translator. Alexa already can translate words and short phrases from and into a variety of languages, but Yahoo’s sources say that Amazon is pushing for a true multilingual assistant that can perform more complex translations. Such a system would need to be aware of cultural as well as linguistic details, as well, as most language is dependent on contextual and situational cues. Yahoo’s sources also note that eventually, Alexa will be able to translate conversations with multiple people speaking different languages at once, perhaps as an outgrowth of it’s recognition systems for multiple users now. Obviously, this is all future-focused; you won’t be able to use Alexa to go to that wedding in Japan just yet. Mercedes isn’t new to experimenting with augmented reality, and at MWC 2018 the company showed off its latest creation with that technology. The “Vehicle Lens” app is exactly what it sounds like: It uses a smartphone to give you an AR view of a car or truck, showing vital information as you move around and point the camera at different parts of your ride. If you have it facing the wheels, for example, you see details about tire pressure. That will come in handy before taking a trip. In addition to that, Vehicle Lens can display engine info like mileage and coolant levels, how much fuel there is and personal info about drivers — including if they’ve been driving for too long. In this particular case, Mercedes is touting the application as a tool for Semi truck drivers and fleet owners, but there’s no reason why it couldn’t also work with its consumer vehicles. The other great part about Vehicle Lens is that it uses the data it collects to make driving recommendations, something that Mercedes says is able to help drivers save up to 15 percent in fuel consumption. Vehicle Lens is already being rolled out to Mercedes’ FleetBoard partners, which is important because it’s proof that the company doesn’t view its latest AR project as just a gimmick.